Watching fishes in our little aquarium at home is very relaxing. I can stare at the swimming fishes all night! I would feed them daily too except that it's not recommended because uneaten fish feed will clog the filter. Speaking of filter, one aquarium hack we've learned from a fish store owner is to add small and soft pebble rocks on top of the usual foam added in filters. The rocks will help clean the filter and minimize the need to replace the foam. Going back to fish feeding, they can actually survive for weeks even without their usual feed products because they can consume moss building up around the aquarium encasing or through other materials found inside such as the aerator, hose, and even items on display. I noticed something different though while watching fishes. One of the fish had eyes which are bulging, widened, and almost dropping. 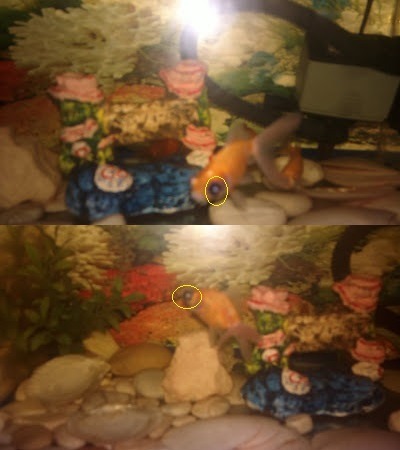 I've highlighted the fish' eyes on the image above. I looked it up online and found out that it's called fish pop eye which is one of the common infections in saltwater fishes. The protruding eye is known as exophthalmia or proptosis. Some of the usual causes include physical injury infection, metabolic disorder, and poor water conditions. So if you notice a similar issue with your pet fishes, I hope you will do something about it. After all, they always do something for you just by swimming where they are.